Practice spatial reasoning skills for IQ-tests and aptitude tests. 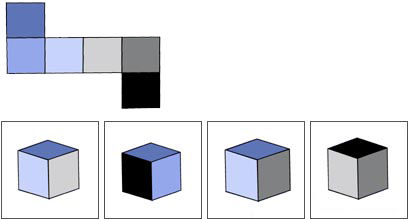 Spatial reasoning or spatial visualization ability allows you to visualize three-dimensional images in your mind and to mentally manipulate these images and twist and turn them into the shape you want. Spatial reasoning is important for generating solutions in areas such as architecture, engineering, science, games, etc. Below is an example of a spatial reasoning test question. To solve this question, you must choose the correct spatial figure that the “unfolding” or “cut out” represents. You can do this by trying to fold the “cut out” in your mind and consequently try to construct the correct spatial representation. The correct answer to this example is "A". Below are find 2 tests with combined 21 questions divided into 2 difficulty levels to practice your spatial visualization ability and your spatial reasoning skills. These are tests are among the finest available and to start the training, choose either the easy or hard test shown below. Have fun! As an alternative to the free tests are the premium spatial reasoning tests with detailed tips and explanations at JobTestPrep.